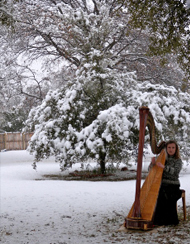 Dallas Harpist, Dallas Fort Worth, Frisco, Denton, Waxahachie & Rowlett, TX. Laurel is well versed in an extensive amount of music choices for every occasion. If you're in need of specific songs, please contact her today, and she will do her best to accommodate you. Laurel is happy to provide consultations at her home, where she can play pieces for you in person. If you would like music chosen for you, she is adept at finding the right music for the occasion. The harp also sounds beautiful with other instruments such as the flute, cello or violin and provides an elegant alternative to string quartets. Laurel invites you to check back often for newly recorded tracks. She has provided you with favorite music from such genres as religious, wedding, classical, popular (musicals, movie themes, love songs), Christmas, Irish and Jewish. Enjoy your visit! If you have any further questions, please contact Laurel today. Call 214.328.6300 or contact us online. Serving the Dallas–Fort Worth Metroplex including in and around Dallas, Fort Worth, Plano, Arlington, McKinney, Frisco, Denton, Allen, Colleyville, Coppell, Garland, Grapevine, Keller, Richardson, Rockwall, Southlake & Rowlett, Texas.